The performance entitled The Merry Wives of Windsor is a version of the comedy with the same title by William Shakespeare, presented though through the expressive power of dance, pantomime and mimicry. The plot follows closely the thread of the play (starting from the second presentation a gossipy innkeeper also presents the story); however, the scenes are enveloped in 16th century dances, thus presenting the relationships between the characters, respectively the characteristic motifs of comedy. The performance offers delightful moments to both old and young, as it speaks in the universal language of dance. The musical background is ensured by the Fonte di Gioia early music ensemble. 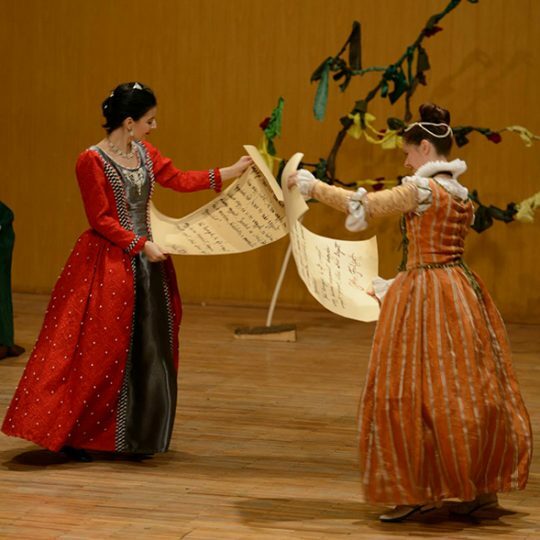 The performance premiered on July 12, 2014 within the Early Music Festival of Miercurea Ciuc, respectively it was presented on January 18, 2015 in Cluj-Napoca, at the Gheorghe Dima Music Academy.